The movie Siddhartha, an adaptation of a novel with same name by Hermann Hesse, depicts the life of a young Indian seeker, who lived during the time of the Buddha. While the Book “Siddartha” by Hermann Hesse is my all-time favourite, the movie doesn’t really make the same impact. But the movie is still worth watching, if possible on the big screen. We have reprdouced the movie here along with the plot summary for you to get a flavour of it. Enjoy! The protagonist Siddhartha, who is the son of a rich Brahmin, leaves his home to seek truth and enlightenment and joins the nearest group of wandering ascetics. Joined by his best friend Govinda, Siddhartha fasts, becomes homeless, and meditates, eventually seeking and personally speaking with the Buddha. Convinced by the elegance of the Buddha’s teachings, his friend Govinda joins the Buddha’s order. But Siddhartha does not follow, and decides to carry on alone, believing that he cannot simply be taught these things from teachers and he must figure out and experience the Truth himself. Siddhartha meets a friendly ferryman, fully content with his simple life. Siddhartha crosses the ferryman’s river and comes to a city, where he is enchanted by a beautiful courtesan named Kamala. He knows she would be the best one to teach him about the Art of Love, but Kamala tells him that he must become wealthy to win her love. Kamala directs him to work for Kamaswami, a local businessman. Siddhartha easily succeeds in business with his wisdom, patience and tranquility. Alongside Kamala becomes his lover and teaches him what she knows about love. Soon, he is leading an affluent life, gambling, drinking, dancing and enjoying all pleasures of the material word. In his middle years, Siddartha realizes that the material world is slowly killing him without providing him any spiritual fulfillment. One night, he leaves it all behind without telling either Kamala or Kamaswami. He returns to the same river and seeks out the peaceful ferryman Vasudeva. The ferryman shares that he attained inner peace through the revelations that came from the river. Siddhartha decides to live and work with Vasudeva. He intently studies the river and spiritual illuminations start unfolding in him like never before. While sitting by the river, he contemplates the unity of all life, and in the sound of the river he discovers the word Om. Some years later, Kamala, now a disciple of the Buddha, is travelling with her son to see the Buddha at his deathbed. She is bitten by a poisonous snake near the river and dies. Siddhartha recognizes her and realizes that the boy she left behind is his own child. Siddhartha attempts to console and raise the rebellious boy, until one day the child flees to a city. Siddhartha becomes desperate to find his runaway son, but Vasudeva advises him to let the boy find his own path, just as Siddhartha did in his youth. In contemplating the river, Siddhartha has a revelation – Just as the water of the river flows into the ocean and is returned by rain, all forms of life, their birth and death are interconnected in a timeless and infinite cycle. With Siddhartha’s moment of realisation, Vasudeva announces that he must depart into the woods, leaving Siddhartha peacefully fulfilled and alone. Toward the end of his life, Govinda hears about an enlightened ferryman and comes to the river to seek wisdom from the now-elderly Siddhartha. He did not recognize that the ferryman was his old childhood friend! Siddartha explains that neither he nor anyone can teach the wisdom to Govinda, because words are limited and can never communicate the totality of Truth. Instead, he asks Govinda to kiss him on the forehead, and when Govinda does, the realisation that Siddhartha has experienced is communicated instantly to Govinda. Govinda bows to his wise friend and Siddhartha smiles radiantly. Both were enlightened! Watching the movie reminded me how Gurudev Sri Sri Ravi Shankar has been espousing total acceptance and celebration of Life through his personal example and the Art of Living movement. This precious knowledge of Life is coming to us as an inner experience not just borrowed words and concepts. Despite all his brilliance and commitment to the Truth, Siddhartha had to be helped and guided by the boatman. It is a great fortune that we in the Art of Living are gently being guided on the path to Truth with so much wisdom and love. 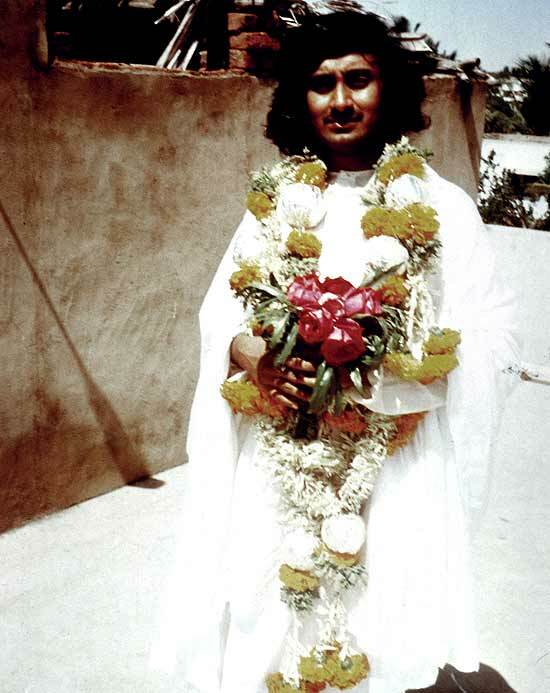 Sri Sri Ravi Shankar was an exceptionally precocious adolescent, who showed a keen interest for the spiritual world early in life. He completed his degree in science and Vedic literature by 17. He was young, but already felt that a special destiny awaited him: “At 17, I felt the whole world was my family. I had that strong aspiration that people celebrate life and live in harmony, specially where there was conflict,” he recalls today. But there were obstacles. His mother’s relatives would berate her: “What has happened to your son? He talks philosophy, he does not behave like a normal person…. You better find him a job and get him married quickly.” Sri Sri would also spend hours performing elaborate pujas, an art he had mastered very young. So again, people would tell his mother: “Don’t allow your son to do so much puja, he may go mad and crazy. He will not study properly.” Sri Sri recalls that every time he would sit for meditation, his mother would hurry him up saying: “Not yet over? You are taking too long. Come on. Study.” The young Ravi Shankar would somehow escape sports classes, come home and do something else. Then his mother would scold him again: “Why did you come so early? Go and play football.” But the young Ravi aspired to bigger things; he would look at his feet and think: “These feet cannot kick anybody, let alone a ball,” and refuse to go. To please his mother, he even went for an interview with a bank. But as it turned out, he interviewed the interviewers instead of the other way around! They asked him what he was doing. When they found out that he taught meditation, they got so interested that they wanted to know more. Sri Sri sat down and showed them a simple meditation technique! He was selected and sent a round-trip ticket to New Delhi. He never went. But shortly thereafter, he met Maharishi Mahesh Yogi, whose Transcendental Meditation (TM) was already known the world over. Maharishi was at that time conducting Veda and science conferences all over India and bringing scientists and Vedic scholars together on a single platform. Sri Sri was very young, but Maharishi recognised his abilities and put him to work. He was thus sent to various places to give talks on the Vedas and science. But he had a problem: “I looked so young,” he smiles, “that people did not take me seriously.” Thus, he started growing a beard, “to look a little mature”. He thought at that time that he had the most wonderful job in the world: Maharishi would send Ravi Shankar to represent him at various maths (monasteries) and ashrams—including the Ordaining Ceremony of Guru Mai Chidvilasanand by her Guru Baba Muktanand. “I went to Ganeshpuri (located near Mumbai) with two truckloads of sweets!” he recollects. Baba Muktanand received him and the group of pandits accompanying him very warmly. Later, Maharishi dispatched Sri Sri to different European countries to expound on the Vedas and science. At that time, he thought that to work tirelessly to set up Veda, science and ayurveda, the ancient and unique Indian medical system, was a pioneering job. Indeed, all his life, Sri Sri would keep his commitment to ayurveda, later establishing an ayurvedic college in his headquarters in Bangalore, from where hundreds of doctors graduate every year. Sri Sri Ravi Shankar also became one of the best-known spiritual leaders of India, and founded the Art of Living movement, whose volunteers make it the second largest NGO of the world after the Red Cross. LikeOutlook, Sri Sri thought big and made it big!